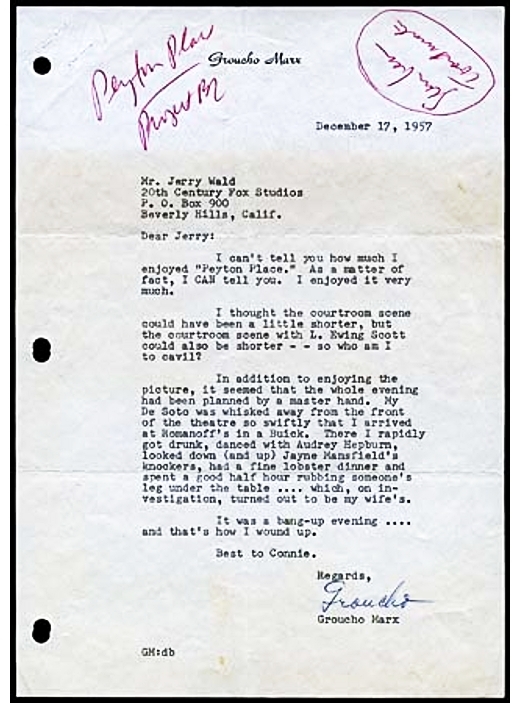 On December 17th of 1957, having recently attended the world premiere of Peyton Place, the ever-witty Groucho Marx sent the following brief letter to the movie's producer, Jerry Wald. Essentially a congratulatory note of thanks, Groucho's unflagging sense of humour shines through as, after first mentioning the ongoing Leonard Ewing Scott murder case, he proceeds to amusingly recount the film's drunken after-party at Romanoff's. Transcript follows. Image courtesy of Walt McCord. I can't tell you how much I enjoyed "Peyton Place." As a matter of fact, I CAN tell you. I enjoyed it very much. I thought the courtroom scene could have been a little shorter, but the courtroom scene with L. Ewing Scott could also be shorter -- so who am I to cavil? In addition to enjoying the picture, it seemed that the whole evening had been planned by a master hand. My De Soto was whisked away from the front of the theatre so swiftly that I arrived at Romanoff's in a Buick. There I rapidly got drunk, danced with Audrey Hepburn, looked down (and up) Jayne Mansfield's knockers, had a fine lobster dinner and spent a good half hour rubbing someone's legs under the table .... which, on investigation, turned out to be my wife's. It was a bang-up evening .... and that's how I wound up.